The Blues faced Collyers of Horsham in the Sussex Schools County Cup Final on Wednesday afternoon. Brighton RFC hosted the match and the first team pitch was looking good as the players ran out for the kick off. Worthing played with a strong breeze in the first half, however it was the Collyers side that scored the first points with a try down the right hand side. The Blues struck back quickly with an excellently worked try with Tomlinson as the beneficiary. Rawlinson added the extras for a 7-5 Blues lead. Collyers had the better of the next five minutes and scored another very well worked try on the right hand side. 7-10 Collyers. Worthing were soon back in the box seat with a try created on the counter attack, the ball going through 4 sets of hands culminating with a line break from Bradford and the second score for Tomlinson. 12-10 Blues. SEE ALSO Worthing College netballers are crowned national champions | Who do Sussex's sides have to face in their battles for promotion and relegation? | Can you see anyone you know in our picture special from Lancing v Horsham YMCA? The second half started with plenty of pressure on the Blues line from Collyers and it was not long before they bundled their way over for a well deserved try under the posts. The extras we added for a 12-17 Collyers lead. Worthing had no intention of capitulating and cracked right on with their up tempo game. The Blues were looking dangerous every time they moved the ball, so when Davies cut out pass over the lines of Fitzsimmons and Dengate hit Rawlinson in the wide channel it wasn’t a surprise there was space to attack the fullback. Timing his pass perfectly, it set Hammond up for a walk in from 5m out. 17-17 Blues with the kick to come. Captain Rawlinson scored just inside the right hand post and the Blues were out to 19-17 and Worthing took the lead which they’d not relinquish for the remainder of game. The Blues continued in this manner and from a scrum inside the Collyers 22m Davies tipped to Cade, he challenged two defenders and dropped the ball off to Hammond, he powered his way over the line for the five pointer. 24-17 and Rawlinson to attempt the extras, another great nudge took the Blues out to 26-17. Mackinder was then on the score sheet as the Blues pushed ever harder for the win. A short range effort using strength to get over the line was one for the forwards and the extras were happily collected by Rawlinson. 33-17. Collyers continued to show their fighting spirit and made a mini come back scoring a converted try which was unconverted to make it 33-22 which was the conclusion of scoring for the day. Worthing pushed again and went the length of the field with Rawlinson scoring under the posts only for the assistant referee to call play back (correctly) for a knock on. In fairness to the contest a 40-22 would not have been reflective of the game as it was much closer than that. It could be argued the the final 33-22 score line may have flattered Worthing. I’m sure both sides would point to moments when they could have added to their totals throughout the match. Coach Ben Coulson has been delighted with the performance over the season. He said: ""We have worked tirelessly and travelled a great distance as a group. This was always going to be journey, bringing players from numerous different schools, clubs and countries together, but a very successful one it's proven to be. "Raiders squad members Tom Young and Tom Adams have been integral parts of the success of the squad this year, with their coaching input elevating the quality of provision hugely. The players and I have been very lucky to have them on board this year"
On the game, he said: "The players executed the game plan brilliantly on both sides of the ball. "We scored some excellent tries, with standout performances from James Hammond (younger brother of Quins & Raiders George) and Morgan Tomlinson (younger brother of Raiders Kieran) both scoring two. 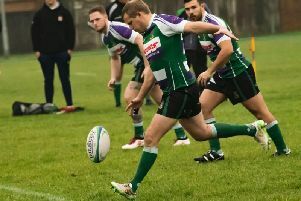 "Will Rawlinson captained the side kicking 80% from the tee and providing a real threat from deep with Brad Smith carrying really well from 8 making meters every time he got the ball." He added: "Well over half of the squad will be returning so I'm hoping the start point will be further along the developmental pathway than this year. "I'm incredibly excited about the trials and looking forward to working with more talented students next year. "There are a number of students that have already been in contact and I'm expecting there will be more, we want to build on this success. We believe players make huge progress with us at college while progressing at their clubs also, it a great balance. "Students from all over are welcome. We hope to have Internationals from Italy and Holland again next year as well as players from Hove, Brighton, Worthing, Bognor and Pulborough RFCs as we have this year. "If there is any area of talent or potential, whether it be skill, game understanding, physical or psychological we want to work with the student to improve their rugby and help them develop as young men. "There's been more than 15 college/former college students represent the Raiders in the last two seasons, England counties U20 internationals, as well as internationals for the Philippines and age grade players in Holland all of whom have studied and played at the college. It's a pathway."